ANC Northern Cape chairperson Dr Zamani Saul, Veterans League secretary Violet Meruti, party's provincial secretary Deshi Ngxanga and Rebecca Maropong spouse of the centenarian. 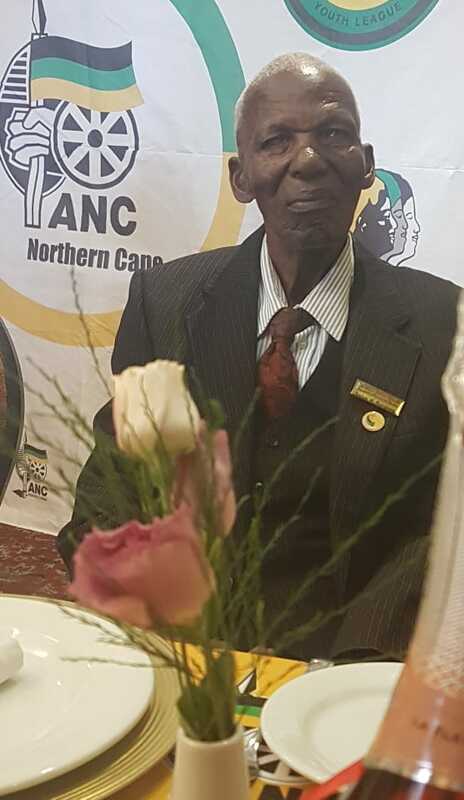 It is a century and seven years and not out at 107 years old for one of Kimberley’s oldest residents in the person of ANC veteran Wilson Gabaitingwe Maropong. The centenarian was born a day before the Bloemfontein founding of the ANC on January 8 in 1912. 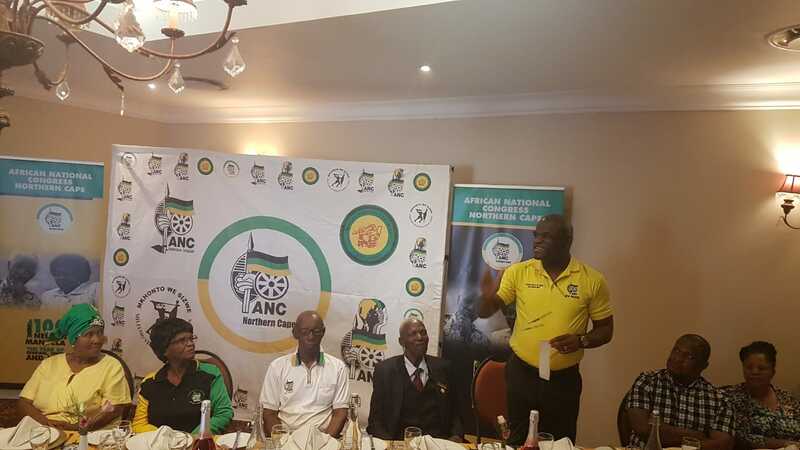 In marking Maropong’s longevity milestone which coincided with the ANC own 107 anniversary today, the party’s topmost provincial leadership joined his loved ones in a sponsored birthday bash held at the Protea Hotel on the fringes of Kimberley’s Big Hole. “I have written down what he used to relay to me, the Second World War, his meetings with the likes of Nelson Mandela and Walter Sisulu who were lawyers in Johannesburg. He also told me about an incident of being shot in the foot and escaping to Kimberley in evading arrest. The bullet was removed by a certain medical doctor known as Dr Letele who was forced to flee the city,” recalled the struggle veteran’s spouse Rebecca on behalf of the lifelong teetotaler whose hearing and eyesight are no longer sound. The pinnacle of Maropong’s lifetime matches that of Kimberley as one of South Africa’s economic epicentres of the 1900s. Born at Schmidtsdrift, it was in the glory days of his adult life that his base – Galeshewe – mushroomed into a sprawling township in the early 1950s on the back of Greater Number Two’s evolving mine worker compounds and overcrowding. The former mine worker, witnessed it being classified the Galeshewe Town Council in 1983 and as the first ever black controlled municipality. “We all stayed in backyards, I was at Wesi Street and Maropong at Bella. When we got houses in what was known as Vergenoeg, I immediately befriended Maropong around the late 1950s as we were both from Schmidtsdrift although he had also lived in Johannesburg,” recounted Maropong’s neighbour of Seocwareng Street, the 85 year old George Molelekwa, a forced removal victim of Schmidtsdrift. Maropong has outlasted not only some of the city’s diamond mines but also outlived two of the ANC’s most revered presidents in Oliver Tambo and Nelson Mandela who were born in 1917 and 1918 respectively. “He has more than 70 years of involvement in the freedom struggle and kept being actively involved after independence to ensure that we improve the quality of life of our people. We are very grateful for the extraordinary blessing of Ntate Maropong living up to 107 years and he is still strong. We are expecting him to make many more years. As the ANC we send our regards to his family for the sacrifices they have made in allowing him to be part and parcel of the movement,” said the ANC’s provincial chairperson Zamani Saul appreciatively. 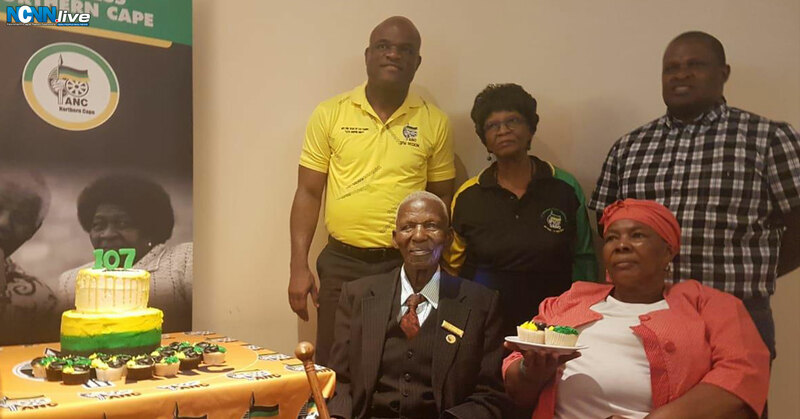 ANC Northern Cape chairperson Dr Zamani Saul, Veterans League secretary Violet Meruti, party’s provincial secretary Deshi Ngxanga and Rebecca Maropong spouse of the centenarian. Birthday Celebration: ANC veteran Wilson Maropong was born a day before ANC founding on January 8 1912. Thabo Mothibi is a former broadcast journalist (TV and Radio) – with specialist reporting experience; SABC Political/Parliamentary and TRC Teams over a period of five years (1995 to 2000). One key foreign assignment - is the 11-nation African Connection Rally – overland journey from Africa’s northern-most pole in the coastal Tunisian city of Bizerte to the southern-most pole in South Africa’s Cape Agulhas. From the journalistic years, Thabo then delved into Government media liaison and serving two former Ministers and three MECs. He became the Northern Cape Provincial Government’s first department based Communications Director at Department of Agriculture, Land Reform and Rural Development - 2008-2010 – where he also served as Head of Ministry from 2003 – 2008. As a former anti-apartheid activist, his political background and professional training aided him in spearheading the Northern Cape ANC’s 2004 National Elections media and publicity campaign and that of the 2006 Local Government Elections. 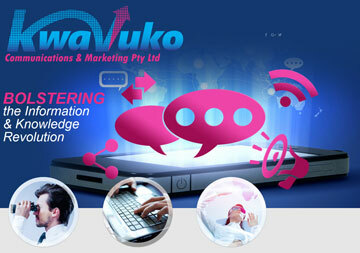 Whilst based in Waterkloof in Pretoria -2010 to end 2011, he consulted for Manstrat Agricultural Intelligence, then returned to the Northern Cape in 2012 to date, to consult independently and pursue other entrepreneurial interests in media and communications through KwaVuko Communications and Marketing. Thabo Mothibi obtained his NQF7 through Wits University’s Graduate School of Public and Development Management (P&DM) in Johannesburg, a Unilever Mandela Rhodes Academy for Marketing and Communications Academy (UMRA). The goal of the NQF7 programme was to educate and train public and private sector professional communicators and marketers in government communications..